Does Timing Matter in Sales? Oh Yeah! Timing, you often hear, is everything in life. And, to a certain extent, it’s true. You just happened to be at the same party as your future spouse on the night you met. A friend invited you to a game, and you saw your favorite player have a career performance. Timing can be critical to your livelihood, too … especially if you’re in sales. Contacting a prospect, at the exact moment they happen to need your product or service, is the ultimate sales catnip. You actually found the needle in the haystack! Timing, you often hear, is everything in life. And, to a certain extent, it’s true. You just happened to be at the same party as your future spouse on the night you met. A friend invited you to a game, and you saw your favorite player have a career performance. You checked into last-minute tickets for a big concert, and landed in the third row because a cluster of great seats was just released. 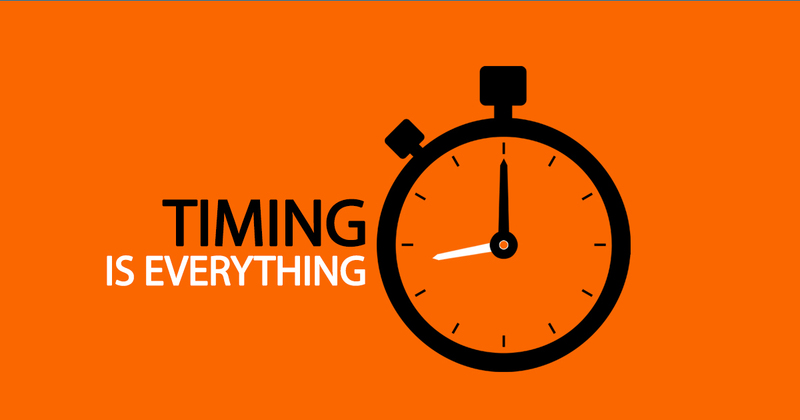 Timing can be critical to your livelihood, too … especially if you’re in sales. Contacting a prospect, at the exact moment they happen to need your product or service, is the ultimate sales catnip. You actually found the needle in the haystack! It’s also extremely rare for most sales reps.
No, most sales don’t happen right away. They occur after a prolonged period of creating a relationship and building trust. It’s really “conditioning” your prospects – a process that bears a certain similarity to dog training (as I wrote about two weeks ago) and, to be successful, a ruthless devotion to following a plan to conclusion (similar to Frank Underwood, as I described last week). A plan to condition your prospects involves timing – have no doubt. You must implement specific steps at carefully-identified times. Deviation is not an option. What are these steps? I outlined the first two last week. Both involve delivering value to the prospect – a premise that continues moving forward. 3) Mobilize your Centers of Influence: We all have networks. If you’re in sales, it’s your lifeline. So, think hard: Who in yours could be a valuable resource, or strategic partner, to the prospect? Identify three people whom they would enjoy meeting, and derive benefit from knowing. Maybe it’s well-connected professional services providers. Perhaps it’s someone who works in a parallel industry. Just be sure they’re people who know the difference between “networking” and “selling” – but, of course, these are the only people you associate with, right? Do the legwork. Reach out to your CIO contacts and ask if they’d like to meet the prospect. Once agreed, tell the prospect you have some great people for them to meet. Be sure to explain the value for them. Do you need to be present? Maybe. Some people aren’t natural networkers. They might not be comfortable meeting complete strangers. Play it by ear. If need be, ask. Sure, it takes time. But it’s also another touch point with the prospect. 4) Send a referral: Want to make a friend for life … and increase your chances of a sale? Send a high-quality referral to the prospect. Simply put, nothing works better to cement a relationship. A “high-quality” referral means someone who could be a legitimate prospect for the prospect – perhaps not today, but at least in a year. Do this right, and you’ll engender immediate, deep gratitude. You’re going to have to use your CIOs again here, or perhaps dig deep into LinkedIn. You might need to contact second-degree connections, using an intro from your first-degree links. If you don’t know the type of referrals your prospect is seeking, ask them. Or, if you’re embarrassed you don’t know – and don’t want to admit this – look at their company web site, or LinkedIn profiles of people in the same field. Nothing proves the value of a relationship like a high-quality referral. Where there’s one, there might be more. Do this, and you’ll be more than a blip on the prospect’s radar. My next post will examine two more steps in the conditioning process. Timing here, though, does matter … because Tuesday is Christmas! Look for the next segment in two weeks. Happy holidays!